SpaceX tweeted this photo of the Falcon 9 rocket vertical on the launch pad on the day it planned to launch 6 Orbcomm OG2 satellites from Cape Canaveral, Florida, June 20, 2014. SpaceX has delayed its next launch again, this time to early July. 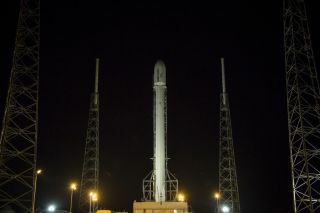 The private spaceflight firm was originally scheduled to loft six spacecraft for the satellite-communications provider Orbcomm on Friday (June 20) from Florida's Cape Canaveral Air Force Station, but that attempt was scrubbed after engineers detected an unexpected pressure drop in SpaceX's Falcon 9 rocket. Bad weather nixed a chance on Saturday (June 21), and Sunday's (June 22) attempt was initially pushed to Tuesday (June 24) to investigate an issue that came up during pre-flight checks. But SpaceX representatives said today (June 23) that they need more time to deal with the possible issue, which they didn't describe in detail. "SpaceX will stand down Tuesday while our engineering teams evaluate further, which will also allow the Range [Cape Canaveral] to move forward with previously scheduled maintenance," SpaceX and Orbcomm representatives said in a mission update today. "We are currently targeting the first week of July and will work with the Range to confirm the next available launch opportunities." The launch will loft the first six members of the OG2 (short for "Orbcomm Generation 2") satellite constellation. SpaceX will launch a total of 17 OG2 craft this year. During the OG2 launch, SpaceX will also attempt to bring the Falcon 9's first stage back to Earth in a soft ocean splashdown. The company managed to do this in April during the launch of SpaceX's robotic Dragon cargo craft to the International Space Station for NASA, though rough seas destroyed the rocket stage before recovery boats could get to it. Such efforts are part of SpaceX's plan to develop a fully and rapidly reusable launch system. Reusable rockets could slash the cost of spaceflight by a factor of 100, opening up the heavens to manned exploration, SpaceX founder and CEO Elon Musk has said. Such ambitious goals are central to the mission of SpaceX, which Musk said he established primarily to help make humanity a multiplanet species.